After all the can of worms Donald Trump opened up last week, here is roughly what US laws state about what you can and can’t do regarding the anthem and flag. Note that much of them aren’t enforced. That means facing the wrong direction, slouching or failing to put your right hand over your heart while the anthem plays at a sports event is technically a sign of disrespect. But everyone does it anyway. I’m sure talking during the anthem is frown upon but is done anyways. Seen the flag carried horizontally many times such at sporting events, plenty of cases where the flag [or a portion] used in bathing suits, t-shirts, shorts, etc. The general availability of SQL Server 2017 was announced and is scheduled for release on October 2nd. Trial version, Express edition and others will be available on or after that date. Office Server 2019 [including Office clients, Exchange, SharePoint and Skype for Business Server] will be released in the second half of 2018 [more likely in the fall around September when Windows 10 v1809 is expected to be released]. [Not announced officially yet] But not surprising, Windows 10 v1709 and Windows Server 2016 v1709 will be released this week. Experience a black screen in Windows 10 v1703? If you are experience a black screen after every reboot for anywhere from 5 minutes to 10 minutes after installing an application from the Windows Store and you are using a computer that came with Windows 10 v1703 [i.e. a computer made by Dell, HP, Acer, ASUS, etc. ], there is an update to correct this here. It seems that there are some registry keys in Windows 10 v1703 “…that conflict with the app readiness service”. Another terrorist attack in London – this time in their subways with an improvised explosive device. Right away Donald Trump is adding it to another reason to have a larger travel ban. And right away, UK Prime Minister Theresa May saying “never helpful for anyone to speculate on what is an ongoing investigation.” There is no indication at this time whether the bomber are foreign. UK has had some British-born citizens who have been behind various terrorist attacks – aside from the days of the IRA. Trump even tweeted/whined that it was done not far from Scotland Yard [the rough equivalent of the FBI]. “Must be proactive!” Hmmm. London has the second more CCTVs than any city in the world but they can’t be everywhere. Trump didn’t seem to rush to comment about the Charlottesville on US soil but did for London this time – and at least the last time when there was a terrorist attack not on US soil. Later Trump, in Florida to view damage from Hurricane Irma, said he is not looking at “citizenship” or “amnesty” but that they are “looking at allowing people to stay here.” He added: “If we don’t have the wall, we are doing nothing.” This sort of contradicts his other statement. The comments come hours after Sen. Chuck Schumer and Rep. Nancy Pelosi announced that they had agreed to the framework for a deal to protect hundreds of thousands of young undocumented immigrants in the United States that would also include a border security package that did not fund the wall along the border. The agreement was struck over dinner of Chinese food and chocolate pie at the White House on Wednesday night. Trump pushed back on Twitter, saying that no final deal had been struck because a “No deal was made last night on DACA. Massive border security would have to be agreed to in exchange for consent.” As usual from Trump – vague. Rep. Steve King, arguably the most anti-immigrant member of Congress, tweeted that if there is a deal “Trump base is blown up, destroyed, irreparable, and disillusioned beyond repair. No promise is credible.” He added “Amnesty is a pardon for immigration law breakers coupled with the reward of the objective of their crime” – except they were children when they entered the US. It was their patents that broke the law. House Democrats sent special counsel Robert Mueller what they say is evidence that former national security adviser Michael Flynn failed to disclose a trip he took to the Middle East to explore a business deal with the Saudi government and a Russian government agency. It is illegal under federal law to knowingly falsify or conceal relevant information from a security clearance form. Trump said “we’ve had bigger storms than this” after Hurricane Irma devastated the Caribbean and parts of the south-east. Prior to it coming he tweeted “Hurricane Irma is of epic proportion, perhaps bigger than we have ever seen” and “Hurricane looks like largest ever recorded in the Atlantic!” Yes – Trump the hurricane expert. The U.S. Department of Commerce in April imposed tariffs on Canadian softwood [i.e. lumber] imports after agreeing with the U.S. Lumber Coalition that Canada was unfairly subsidizing its lumber producers, an allegation Canada denies. Trump of course sided with the coalition. Since then cost of building a house or a large building has increased because there is a smaller supply of lumber in the US. But after the two recent hurricanes, America will need plenty of lumber. Most of the devastation came from house made mostly of lumber [because they can’t afford bricks]. Trump maintained his controversial position that people on both sides of the deadly Charlottesville clashes were at fault, one day after meeting with the lone African-American Senate Republican [Tim Scott from South Carolina] who publicly condemned him over it. Trump claimed that many people have said he had a point when he remarked that there was “blame on both sides.” Uh huh. Meanwhile, Congress is sending a bipartisan joint resolution condemning the Charlottesville violence — as well as “white nationalists, white supremacists, the Ku Klux Klan, neo-Nazis, and other hate groups”– to Trump for his signature. The House passed the joint resolution by unanimous consent, a day after the Senate easily approved it. It’s embarrassing to have to force the President to approve it. House Majority Leader Kevin McCarthy made a fresh push for Senate Republicans to change rules to make it easier to break filibusters of spending bills, echoing a similar call from President Donald Trump for the Senate to set aside long-held precedent that requires at least 60 votes for major legislation to pass. McCarthy tried and failed in 2015 to do the same. Earlier this year, more than half of the Senate Republican conference signed a letter stating that they did not support changing the filibuster rules for legislation. This includes McConnell and Ryan. Sounds like Pro-Trump McCarthy wants to change rules when he thinks they need to be changed to fit his [or Trump’s] agenda. A bipartisan group of senators is opposing President Donald Trump’s pick to head NASA, arguing he is a political appointee who doesn’t have the necessary experience to run the agency. Trump’s nomination is Jim Bridenstine a current GOP congressman from Oklahoma and former Navy aviator. But GOP Sen. Ted Cruz of Texas, chairman of the Senate Subcommittee on Space, Science and Competitiveness, said he supported the nomination. Figures. Bridenstine graduated from Rice University with majors in economics, psychology and business and has an MBA from Cornell. After serving in the military, he worked a four-year stint as executive director of the Tulsa Air and Space Museum & Planetarium. Running a space museum [with no science education] is not the same as running NASA. It is interesting to note that North Korea’s missile testing has occurred with more frequency under Trump’s first 9 months than any previous presidents. Coincidence? 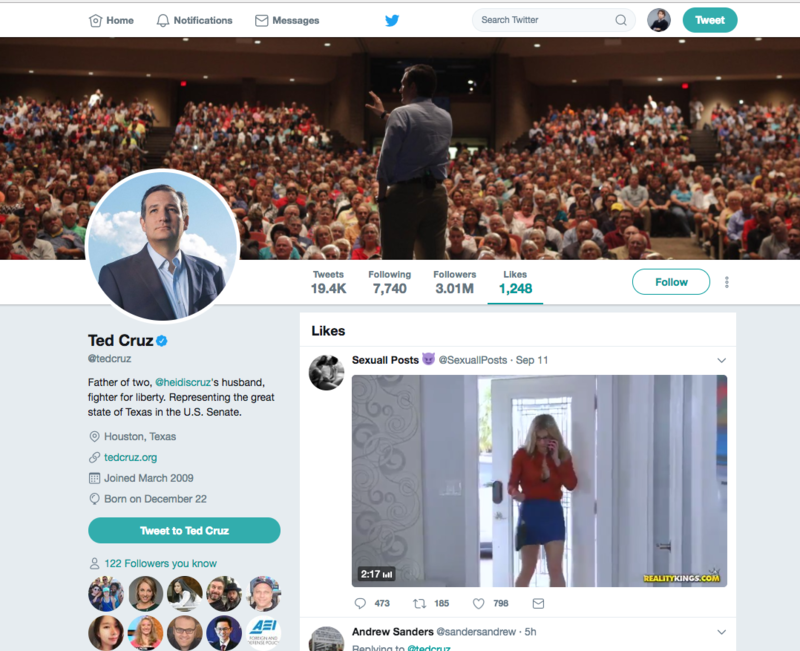 A pornographic video that was “liked” by Ted Cruz’s Twitter account has been removed and reported to Twitter. It’s unclear who was responsible for the like or if Cruz’s account was hacked. His communication director did not initially address how the tweet happened. Could be a hacked account but nothing else odd was tweeted. “It was a staffing issue and it was inadvertent, it was a mistake, it was not a deliberate action,” Cruz said. “We’re dealing with it internally but it was a mistake, it was not malicious conduct.” An aide to Cruz added that there would be an internal effort to figure out who was responsible. Some of Trump’s legal team believed that his son-in-law Jared Kushner should have stepped aside before reports about his failure to disclose contacts with Russians during the transition became public this summer. Staffers had begun to prepare a statement in case Kushner did ultimately resign. Of course everything is denied. Trump’s “Election Integrity” commission is in New Hampshire to look for evidence which is led by Kansas secretary of state Kris Kobach and has scheduled a series of presentations from long-time advocates for stricter controls on voting. Kobach himself is already under fire after publishing a Breitbart op-ed in which he claimed out-of-state voters took advantage of New Hampshire’s same-day registration laws and cast fraudulent ballots that tipped the outcome of the state’s election in Clinton’s favor. So I guess Trump thinks Kobach is not biased then. And yes, New Hampshire with it’s huge population would make a difference in an election. Sarcasm. ESPN later said that Hill’s tweets “do not represent the position of ESPN. We have addressed this with Jemele and she recognizes her actions were inappropriate,” the network said. Hope Hicks, who was named interim White House communications director in August, will now hold the job on a permanent basis. Malaysia’s prime minister visited the White House and met with Trump amid a US Justice Department probe into the PM’s finances. “Le Chateau des Palmiers,” Trump’s 11-bedroom mansion located on the Caribbean island of St. Martin was destroyed by Irma. Mar-A-Lago survived. Some were wondering why Trump’s Mar-A-Lago wasn’t used for a shelter. It was eventually forced to evacuate. But in the end, that side of Florida did not get hit as hard.